I hesitate to even call this a recipe, but that’s actually good news for you! Because that means it’s extra easy. This is one of my go-to dinners when I don’t have anything for dinner. Because even when I have “nothing” in my fridge, I almost always have eggs, salsa, avocado, tortillas, and a batch of cashew cream. Just one of the many reasons I love Mexican food so…even if I have no real plans for these items, they are things I always buy at the grocery store because I can always do something with them. In a small skillet over medium heat, cook tortilla in oil until crispy, 2 to 3 minutes on each side. Remove from heat. While tortilla is cooking, coat a second skillet with cooking spray and put on medium-high heat. Once skillet is hot, crack egg into it and cook until the white is solid, 1 to 2 minutes on each side. 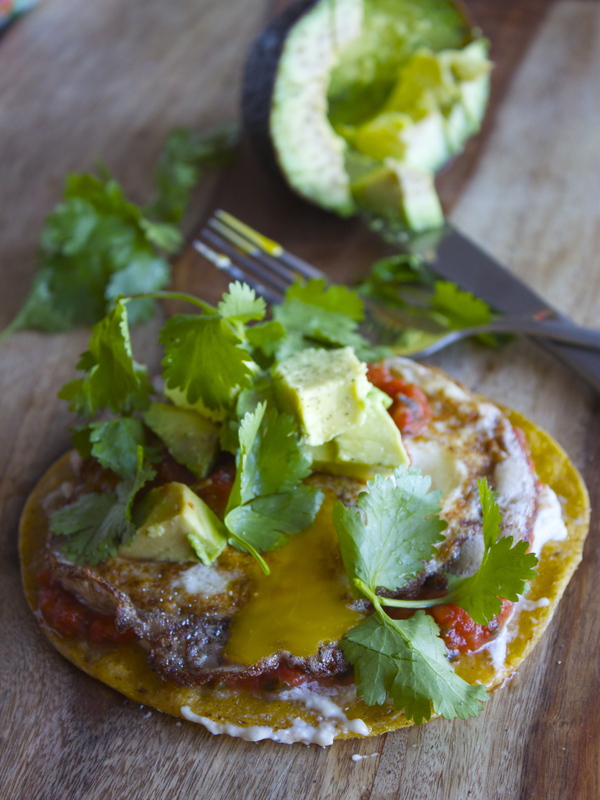 Spread cashew cream on tortilla, pour on salsa, place egg on salsa, then top with chopped avocado and cilantro. Season with salt and pepper, to taste.